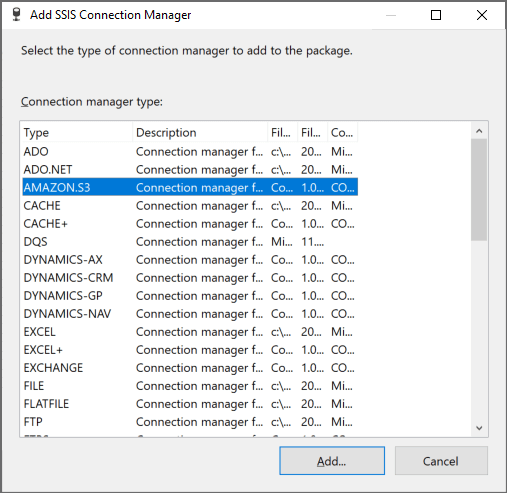 Amazon S3 Connection Manager is an SSIS Connection Manager for establishing connections with the Amazon S3 service. 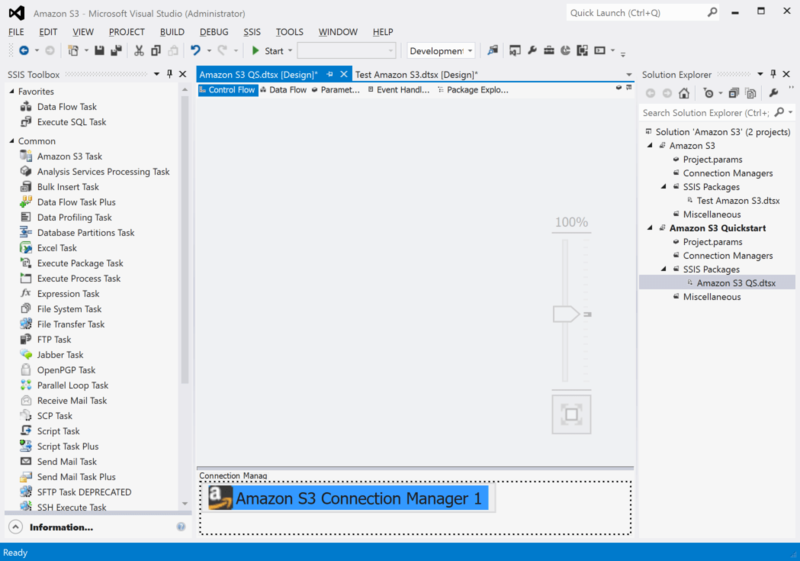 Use the API to build components based on the Amazon S3 Connection Manager. In this section we will show you how to set up an Amazon S3 Connection Manager to access your Amazon S3 service. Select New Connection in the pop-up. Find the AMAZON.S3 connection manager and select it. Then click the Add button. Once the connection manager dialog opens, enter a valid endpoint name for your Amazon S3 region for the Host parameter. **Note:** Do **not** include the bucket name here. Enter your Access Key which was provided when you set up the AWS Identity and Access Management (IAM) user. To get the value for this parameter, you must set up an IAM user. Once you have entered the information about the user, the IAM service will provide you with the Access Key and the Secret Key. Enter your Secret Key which was provided when you set up the IAM user. Congratulations! 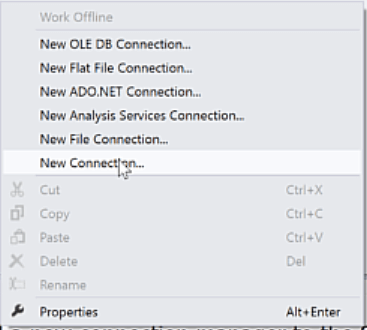 You have successfully configured a SharePoint connection manager. Use the Server page of the Amazon S3 Connection Manager dialog to specify properties for connecting to Amazon S3 service. Specify the name or IP address of the Amazon S3 service. If the bucket you want to use is located in different from the default US East region, you have to specify different end point. For information of each region end points, check the reference here. Specify to establish secure HTTPS connection with Amazon S3 service on port 443. Specify to connect to Amazon S3 service, using regular calling format. Un-check this option when connecting to EU Amazon S3 service. Specify access key for Amazon S3 service. 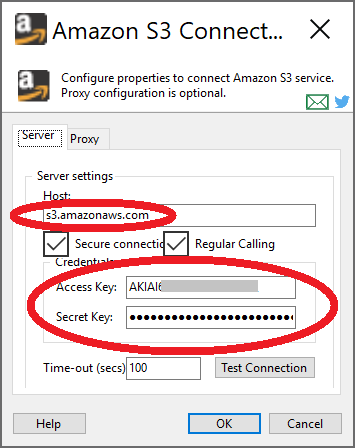 Specify secret key for Amazon S3 service. Specify the number of seconds before timing out session connect. The default value of this property is 100. Use the Proxy page of the Amazon S3 Connection Manager dialog to specify properties if your server is behind firewall. Where can I find the documentation for the Amazon S3 Connection? New: Support for Signature 4 protocol. New: Support for TLS 1.1 protocol and above.